Alice Lloyd College junior Tawny Aguayo and ALC’s First Lady Cindy Stepp are committed to helping those who are unable to help themselves. Although they’re the ones who are putting in countless hours of exhausting work, they say that they’re gaining more than they could have ever imagined. What began as volunteer work at the Kentucky River Regional Animal Shelter in Hazard, Kentucky has turned into much more than that; it has become a passionate mission. Aguayo and Mrs. Stepp work hard each week to ensure that the animals in the shelter are not only well taken care of, but protected from being euthanized. It was not long ago that these two determined women organized a shelter clean-up, welcoming all Alice Lloyd students to participate. “The group cleaned the place from top to bottom,” beamed Aguayo, pleased with the turnout. This past summer, Aguayo and Stepp conducted a road block where they raised over $2,000 for the shelter. Mrs. Stepp also formed a team for the Run for the Hills 5K, which took place on October 5th, in order to further benefit the shelter. The two women run frequent adoption drives for the animals. The most recent of which, “Pet Pictures with Santa,” took place on November 9th. This drive not only helped to showcase the shelter’s animals in order to get them adopted, but also raised a hefty sum of money for the shelter itself. A similar drive will take place on December 7th at Tractor Supply in Hazard. 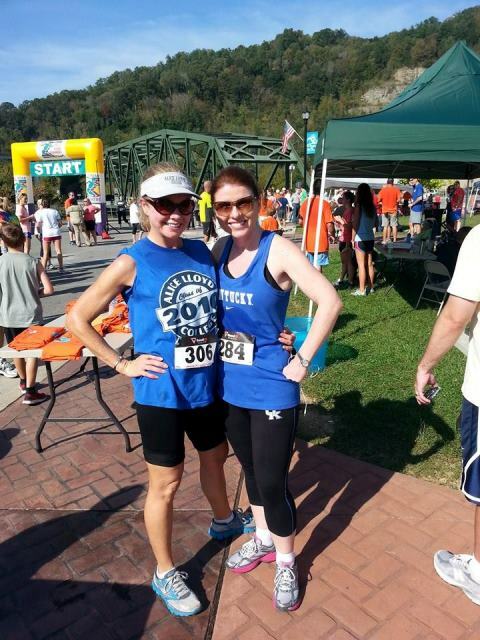 Cindy Stepp, left, at the Run for the Hills 5k race. However, their efforts do not end there. Aguayo and Stepp have found ways to publicize the shelter and its animals. Each week, Aguayo writes an article that is published in Hindman, Ky.’s newspaper, The Troublesome Creek Times. Her most recent article covered Pit Bull Awareness Month and the benefits of autistic children over the age of five years old owning a pet. In addition to this, Aguayo is featured in interviews on WYMT news every other Wednesday morning to introduce viewers to one of the pets and inform them about current events taking place to benefit the shelter. The women have recently collaborated on creating Facebook pages to aide in their mission. The pages “Lost and Found Pets of Knott County” and “Foster a KY Dog” function as a way to help people find lost pets in order to prevent the animals being sent to the animal shelter. This not only keeps the rate of lost animals down, but also keeps the shelter from becoming overcrowded. “Foster a KY Pet” also advertises the shelter’s Foster Program, which protects animals from being euthanized and allows dogs that have been confirmed for rescue visit a foster home for two weeks while they are waiting to be taken to their loving, new home. Their efforts have expanded from there with Aguayo running a YouTube channel designed to showcase pets to potential adopters and rescuers. Aguayo and Stepp transport pets each week to various places, including running “legs” to Indiana, New York, and Minnesota in order to get the animals to rescue groups that will help find them a home. This shared passion has had a positive effect on those around them, and the two have even inspired many other groups, faculty members, and students at Alice Lloyd to take part in their mission. A list of participants has been actively growing: Kyli Breeding, Destiny Caldwell, Daniel and Tiffany Combs, Carissa Conley, Aaron Elliott, Maricka Gibson, Lindsey Gilbert, Brittney Huz, Ryan Irons, Mary Isaac, Mercedes Kohn, Elizabeth Langlois, Han Gia Ly, Haley Lyall, Kaelyn Martin, Hannah Radosevich, Amber Reynolds, Jesse Riffe, Clint Stepp, Brandon Sumner, Adele Williams, Amanda Whitman, the ALC Dance Team, the ALC Softball Team, the ALC Impact Club, the ALC Maintenance Work-Study Crew, and the ALC Radio Station Work-Study Crew. Aguayo went on to mention that she hopes to eventually turn her focus to the health benefits of having pets, especially for families and individuals who suffer from autism and PTSD. Want to help? The Alice Lloyd College Office of Marketing and Communications is taking donations for the Kentucky River Regional Animal Shelter in Hazard, KY. Any and all donations are appreciated. Send your donation to Alice Lloyd College in care of Tiffany Combs.